Development of agents for cancer prevention has been particularly challenging for two main reasons. One is the inherent difficulty in identifying targets for the heterogeneous group of processes that lead to invasive cancer arising at different target organ sites, while the other is the need for safe, tolerable interventions that can be given for lengthy periods of time. The rapidly increasing understanding of the molecular pathogenesis of cancer is providing new opportunities for early intervention, prior to the development of invasive disease. Furthermore, there is an ever-increasing number of approved drugs with many different mechanisms of action. 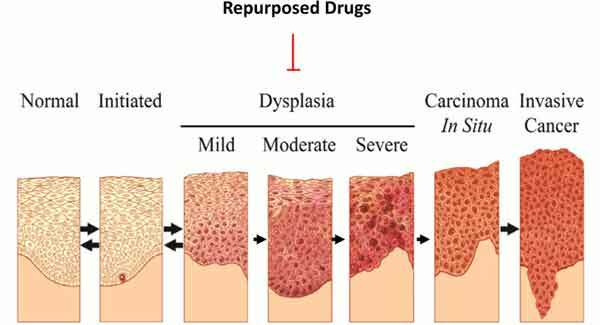 The appeal of using drugs with well described mechanisms of action and safety profiles has led to renewed interest in repurposing such agents for cancer prevention. Here we review the rationale and evidence of effectiveness of three agents that are the current focus of much interest in the field of cancer prevention - aspirin, metformin, and pioglitazone. Aspirin, Cancer prevention, Metformin, Pioglitazone, Repurposing, Risk-benefit. Lung and Upper Aerodigestive Cancer Research Group, Division of Cancer Prevention, National Cancer Institute, National Institutes of Health, 9609 Medical Center Drive, Room 5E-102, Bethesda, MD 20892, USA.